The nine Vedic scholars were collectively carrying out services in the Melkote temple. There is an inscription dated 1,256 C.E, which is the first to talk of - aivadimbaru - the fifty two. There are inscriptions in which the 52 are referred to as pratama sishyas (chief disciples) of Ramanuja (1519 C.E. ), priyasishyas (dear disciples) of Ramanuja (1534 C.E.) and respectfully as ayyas (1,534 C.E.). But who were the fifty two? 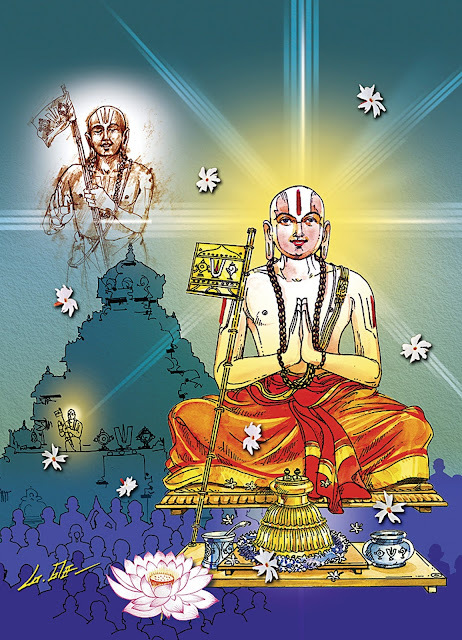 There is a manual called Udayavar Niyamanappadi, which describes the arrangement made by Ramanuja for performing various services in the Melkote temple. ‘Yadavagiri Jeernodhara,’ a book in Kannada, first published in 1932, by Aasuri Tirunarayana Iyengar and Aasuri Srinivasa Iyengar, says a manuscript of Udayavar Niyamanappadi, which was available in the Madras government oriental library, was published by Yogi Parthasarathy Iyengar in 1895. In 1909, the published work was presented as documentary evidence before a court in Mysore state, when a dispute arose about agratheertha – who should receive sacred water first. “S.G. Govindaraja Iyengar translated this work into Kannada. Yadavagiri Jeernodhara says the original translation was with Sri Yadugiri Yatiraja Matha,” says R.K. Narayanan, researcher at the Academy of Sanskrit research, Melkote. 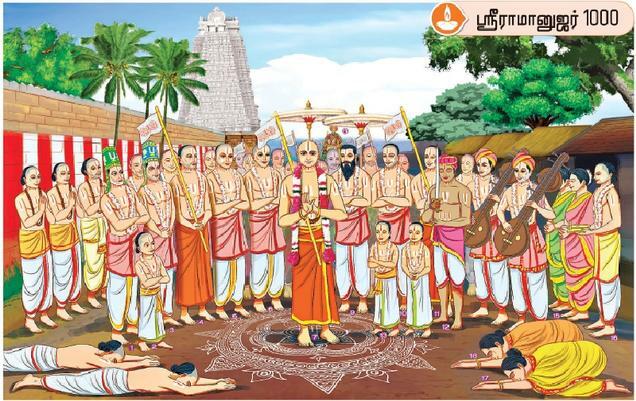 Udayavar Niyamanappadi gives the names of nine Vedic scholars appointed by Ramauja and their duties in the temple. Sri Rangaraja Bhattar, of Oupagayana gotra, Katyayanasutra, Suklayajurveda sakha, was appointed chief priest, with ten duties. There were four sthanikas- Tiruvanatapura dasar (Vasista gotra, Jaiminisutra, Samaveda sakha); Malakara dasar (Koundinya gotra, Bodhayanasutra, Yajurveda sakha); Tirukkurungudi Dasar (Vasistha gotra, Jaimini sutra, Samaveda Sakha); and Yatiraja Dasar of Elayattangudi (Bhargava gotra, Jaimini sutra, Samaveda Sakha). Sadagopa Dasar (Bharadwaja gotra, Jaimini sutra, Sama Sakha) was in charge of vahanas. Tiruvali Annan (Sadamarshana gotra, Apastambha sutra, Yajurveda Sakha) was to carry out orders of the Jeer of Yatiraja matha. Poretru Nayanar from Anbil (Maudgalya gotra, Drahyayana sutra, Sama Sakha) was in charge of gold and silver vessels belonging to the temple and also temple accounts. Tirunarayana Perumal Araiyar (Vadhula gotra, Jaimini sutra, Yajurveda Sakha) was in charge of Astothara and Sahasranama stotra reciting and also musical rendering of pasurams, on the lines of the vinnappam seivar of Srirangam. The services of all these nine persons add up to a total of fifty two. So lithic references to ‘52’ may not be a reference to 52 persons as such. It seems more likely that this was just a way of referring to the nine scholars, who, between them, performed 52 services in the temple. The ‘52’ encouraged donations to the temple. An inscription dated 1,469 C.E. says that acting upon their suggestion, one Nachiyaramma donated lands that she had received from Immadi Proudadevaraya Mallikarjuna, to Sri Vaishnavas who were serving at Kurukulavampadi. They honoured people who repaired tanks, which irrigated temple lands. The 52 administered Trusts related to the temple. This is evident from an inscription dated 1,530 C.E. 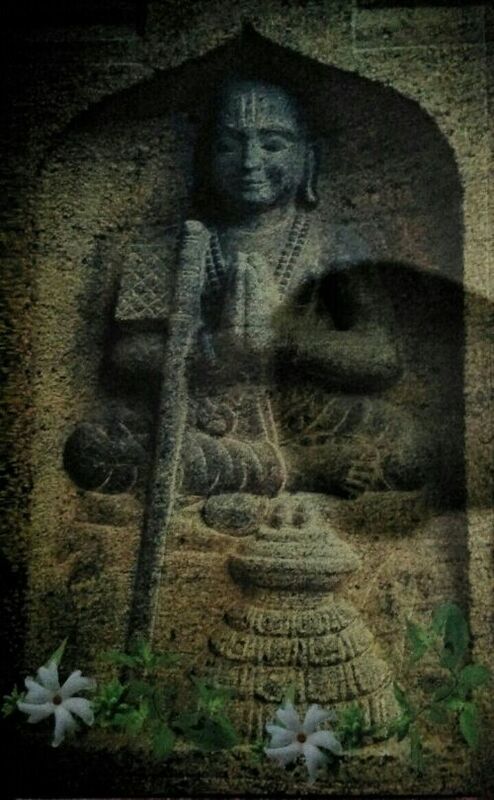 Vasantaraya of the Velugoda family, sold two villages to the Melkote temple, and placed Anantayya as trustee to look after offerings in the Ramanuja kooda. The gift became defunct in course of time. Rayara Nayaka of the Velugoda family, renews the grant, by entering into an agreement with the fifty two. Alvaru Singayya, grandson of Anantayya is appointed trustee. Another inscription dated 1,582 C.E., says that some special privileges to be conferred on Etturu Tirumalacharya, were being recorded by the Treasury officer with the approval of the fifty two. All important transactions, however, bore the signatures of only four persons. They signed as ‘Sri Narayana,’ to indicate that they were acting on behalf of the deity of Melkote. The four must have been the sthanikas. Even today descendants of Srirangaraja Bhattar, originally appointed by Ramanuja, continue to be priests in the temple. When the male line of the family ended, a grandson through a daughter of the family was brought in as priest from Belur. 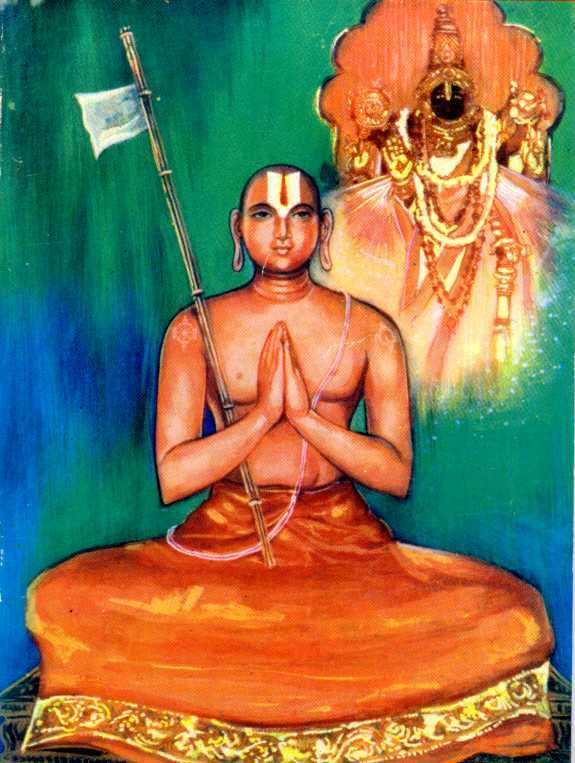 Descendants of the original four sthanikas appointed by Ramanuja also continue to serve in the temple. The second sthanika family, that is Malakara Dasar family- has the right to perform adhyayana homa in front of Ramanuja’s sannidhi on Upakarma day. 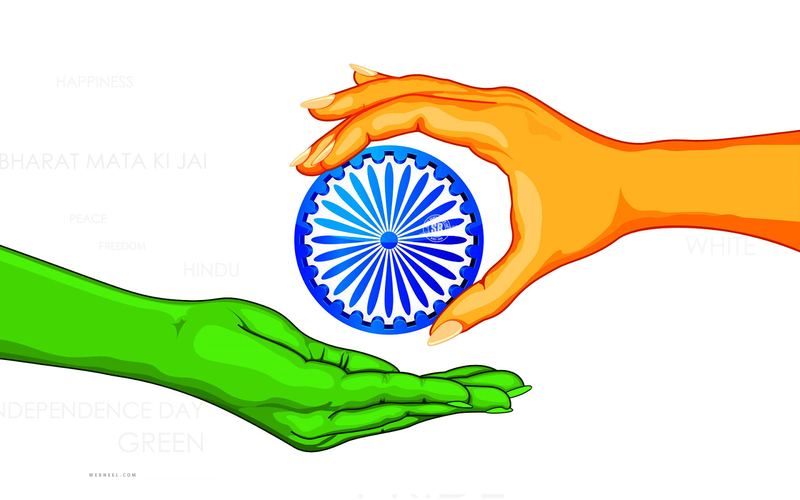 The four sthanikas have the responsibility of reciting the Vedas - the first, third and fourth recite Sama Veda. The second recites Yajurveda. Ramanujamuni Krishna Iyengar, whose father was Jeer of Yatiraja Matha, Melkote from 1970 -1979, says, “The sthanikas in the time of Ramanuja, used to offer biksha to the Acharya. Even today, during the festival marking Ramanuja’s Tirunakshatram, the present sthanikas offer biksha to the Ramanuja idol, during the last four days of the utsava.